Standards: SL1, SL2, SL3, SL4, and SL6 as well as the Standards for Reading Literature and Reading Informational Text. Developed at Phillips Exeter Academy and named after oil magnate Edward Harkness, who in the 1930s endowed several private schools with a large grant to develop student-centered approaches to learning, this method can be used in every content-area classroom and with literary, informational, and/or technical texts. 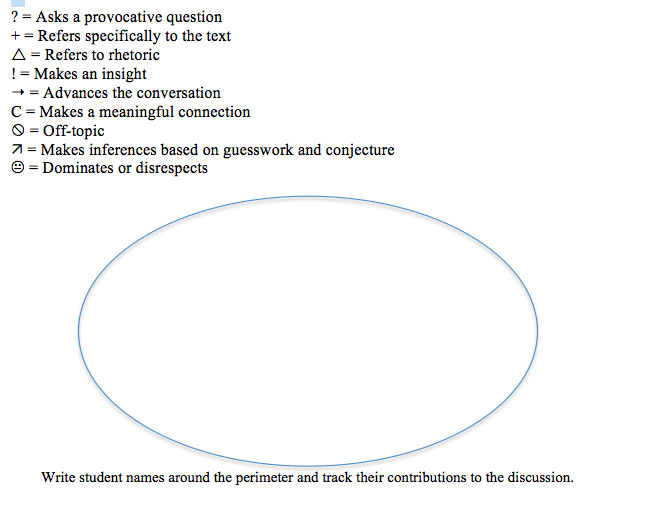 Students sit at large circular or oval tables; the teacher assigns the readings but merely observes the discussion, recording student participation and engagement on a chart. Tracking student comments can feel overwhelming at first because it requires intensive listening on the teacher's part, so at first you may simply wish to draw lines across the "table" to the names of students who speak. With practice, you will begin to add symbols to mark the nature and quality of individual students' contributions to the classroom conversation. This Harkness table notes chart was adapted by RHS teachers Althea Terenzi, Allison Casper, and Mary Ellen Dakin. 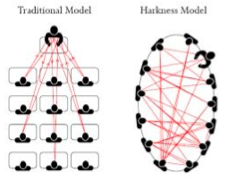 Click here for the Harkness Table Notes handout and the Harkness Progress Tracker for students to self-assess their speaking and listening skills in the context of the Harkness method.